Numbers of people sleeping rough across Scotland have risen for the second year in a row, new figures have shown. 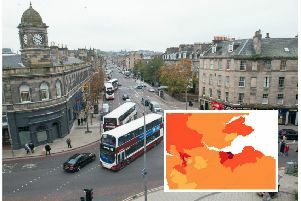 The proportion of people sleeping on the streets before registering as homeless has increased by 10 per cent between 2015/16 and 2017/18, according to analysis by Scottish Labour. The party has called on the Scottish Government to take more action to help rough sleepers. Official figures show 2,682 people reported as having slept rough on at least one occasion in the three months before registering as homeless. This is a slight increase of 22 people, or 1 per cent, on the previous year’s figure, which was itself a 9 per cent rise from 2015/16. Previously, the number had steadily fallen, down from 5,845 in 2008/9 to 2,434 in 2015/16. Scottish Labour believes the true figure of rough sleeping is likely to be higher as not all of those on the streets will register with local authorities as homeless. The party called for the First Minister to look at London’s Combined Homelessness and Information Network initiative which counts rough sleeping numbers and shares information among government agencies, local authorities and voluntary organisations to support rough sleepers. Scottish Labour housing spokeswoman Pauline McNeill said: “Rough sleeping has become a visible sign of a society failing people. “Many more people are vulnerable to homelessness due to the Tory and SNP austerity, and that must be prevented. “It is unacceptable that anyone should be sleeping rough in 21st-century Scotland - yet these figures show that is actually on the rise. She praised the work of the Government’s Homelessness and Rough Sleeping Action group which has set out several recommendations to reduce homelessness and rough sleeping. However, she said it is “farcical” the Scottish Government has agreed to take forward many of these “without acknowledging that our local authorities are starved of resources and need sufficient funding to be able to deliver them”. A Scottish Government spokesman said: “Tackling and preventing homelessness is a key priority for the Scottish Government and we recognise there is more that needs to be done, particularly for people with complex needs who require more than just housing.